This is one of my favorite dishes. The prep takes some time but is entirely worth it. Quaint, rustic, comforting, delicious. It makes a perfect brunch, but I would eat it anytime of day or night. 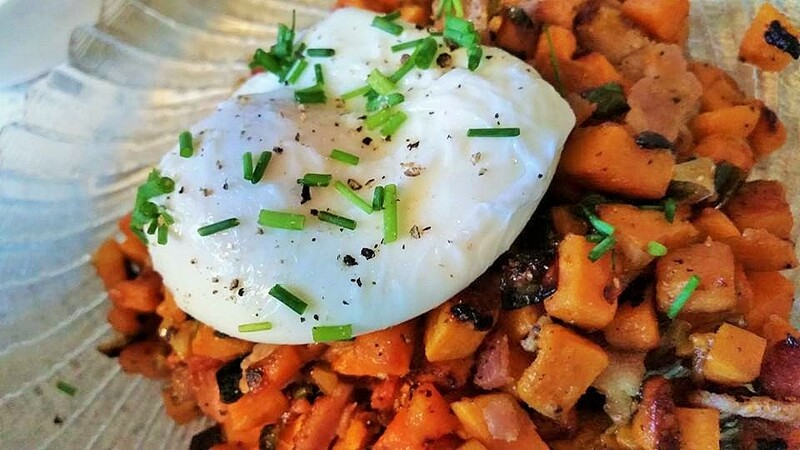 The salty, sweet, smoky hash packs massive flavor. And the crowning jewel is the perfectly poached egg that, when cut into, releases its unctious golden yolk coating the hash in glorious richness. Dice the bacon and cook in a large skillet until the fat is completely rendered. Remove the bacon and save it on a paper towel lined plate. Leave the drippings in the pan. Slice the poblano pepper and remove the seeds and membranes. Dice into fine bits. Peel then dice the sweet potatoes into small cubes. Slice the green onions. Sautee the poblano bits, sweet potatoes, and green onions in the skillet with all the wonderful bacon fat. Stir the contents to coat them entirely in the bacon drippings. Cook on medium heat until the sweet potatoes are soft but not mushy. Add the bacon back in. I use Alton Brown's method for Perfectly Poached Eggs. I have always had good results this way. Place each egg on a bed of hash. Salt and pepper to taste. Sprinkle with freshly snipped chives.